The Star Starlock wheelchair cushion can generally be categorized as an air cushion due to its weight bearing air-filled cells. Star Cushion - the manufacturer of this product - specifies this cushion as follows. The Starlock name is derived from the cushion's unique contour locking feature which is capable of individually controlling the volume of air in every air cell. For example; unlike typical valved air cushions, one can sit on a Starlock cushion, lock the contour produced by the associated pelvic shape being pressed upon the cushion, and then lean to one side or the other without causing the air in the cells to migrate between cells. In other words, once locked, leaning to the side (as one might do to reach something on the floor) does not cause the air cells on that side to squish down in the same way they would in a typical valved air cushion. The air in each individual cell is locked in that same cell. As long as the cushion remains locked the resulting contour remains, even after getting off of the cushion (refer to the picture below). The air lock feature is helpful with respect to stability and to pressure distribution. Assisting in off-loading pressure on sensitive areas, air volume adjustments can be made on a per-cell basis. Presently, the Starlock model is the only valved air cushion exhibiting the aforementioned factory-designed control. Four air cell heights (i.e., cushion thicknesses) are available. The manufacturer lists the following sizing recommendations. 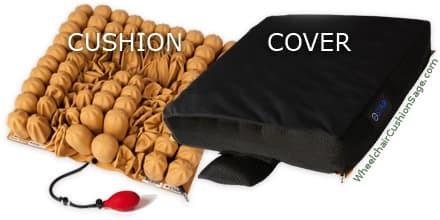 The cover can be washed in a typical washing machine, but the manufacturer recommends avoiding the use of a washing machine when washing the cushion. The cushion itself can be submerged in a tub or bucket, or otherwise hand-washed using common cleaning agents suitable for clothing. Be sure to close the air valve when washing a Starlock cushion so that water does not enter the air cells.